↑ "General Assembly Elects 4 New Non-permanent Members to Security Council, as Western and Others Group Fails to Fill Final Vacancy". United Nations. สืบค้นเมื่อ 9 August 2016. 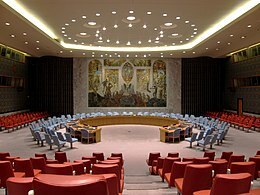 ↑ "Elected to Security Council in Single Round of General Assembly Voting, Italy Says It Will Cede Non-Permanent Seat to Netherlands after 1 Year". United Nations. สืบค้นเมื่อ 9 August 2016. ↑ "General Assembly Elects Belgium, Dominican Republic, Germany, Indonesia, South Africa as Non-permanent Members of Security Council". United Nations. 8 June 2018. สืบค้นเมื่อ 8 June 2018. หน้านี้แก้ไขล่าสุดเมื่อวันที่ 24 มกราคม 2562 เวลา 10:32 น.